My name is Doug; I live in Vermont, and have been growing Hoyas for around Twelve years, but only seriously now for around Eight. Growing Hoyas can be challenging for anyone; but when you grow them indoors, in one of the cloudiest counties, in the cloudiest states in the U.S., there are a few tricks that can make the going (or growing) easier. I have made many mistakes along the way, and my site is devoted to helping others avoid some of the same pitfalls that I have encountered. I will give general advice on growing, and then antidotes and personal experiences with all of the species that I have managed to bloom, and on some that I have not. I am not going to get into any arguments about taxonomy or identification. 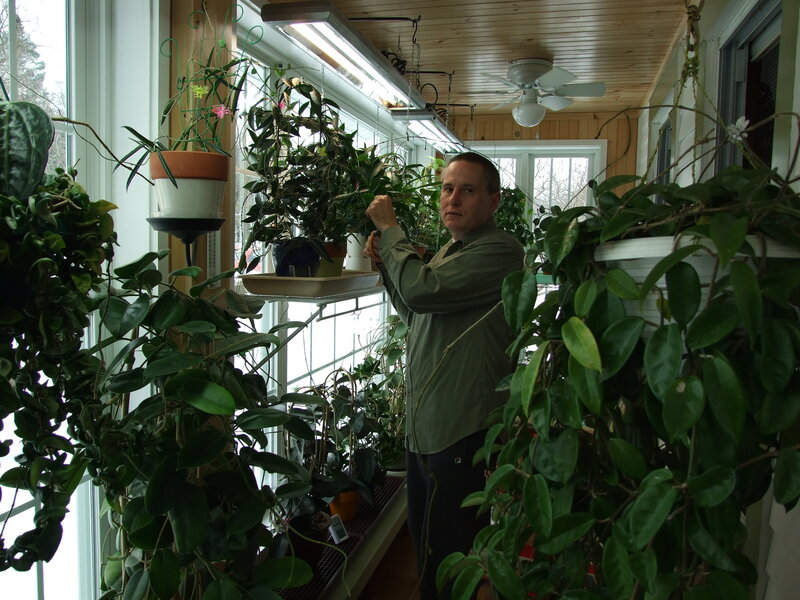 This is not a “scientific site” it is more about how to grow and get the most out of your Hoyas when grown primarily as an indoor houseplant in the colder regions of the world. I hope that you enjoy what you see here, and possibly learn something along the way. A note on the photos: After much soul searching, I have decided not to watermark these photos. I do not like looking at other websites that have copyright symbols and website emblems splashed across the images. I have the peace of mind knowing that I not only took everyone of these photos myself, but spent many months and sometimes years to get some of these plants to bloom and then take a decent photograph. I would prefer that they not be used without my permission, but if you do take an image, please give me or this site credit. There; that is all that I’m going to say on the matter – now please enjoy!